With Jim Nance of Scott County, it's hard to know what goes between the identity commas. You know -- the "handles" like the words in red in this sentence: "Diane Sawyer, ABC World News anchor, grew up in Louisville, Kentucky." Between the commas for Jim Nance we could put educator, outdoorsman, renowned bread baker, heritage cook and cooking teacher, hickory nut aficionado, sourdough evangelist, and "cast iron man." We could also add Favorite Chef's Best Friend, given that much-loved Holly Hill Inn chef Ouita Michel says Jim Nance and his wife, Jan, carried out what she calls "the truest act of culinary friendship I have ever experienced." We will get to that. We will concentrate first, though, on Jim's expertise in locating, restoring, collecting and selling fine old cast iron cookware. I talked with Jim about cast iron earlier this year at his large booth at the Scott County High School Antique Show. I'd like to think I know something about cast iron, since I cook with it virtually every day of my life, and trust it as I trust no other cookware. I quickly realized, however, that my knowledge of cast iron is equivalent, say, to knowing how to turn on my computer. By contrast, Jim's encyclopedic understanding of the provenance, history, care and use of cast iron amounts to knowing how to build a computer from scratch, including making the semi-conductor chips himself. 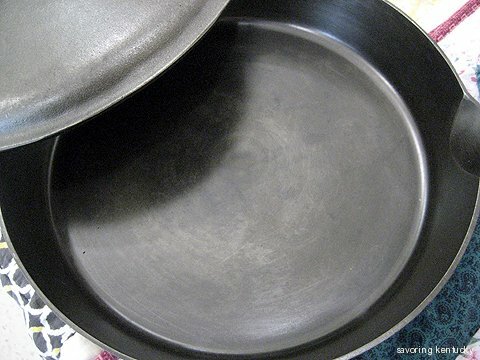 Jim's cast iron, made by famed companies like Griswold, Erie, or Wagner, looks lighter in color and weight, sleeker, and vastly more elegant than the scratched, pitted, uneven, carbon-black (and still effective) skillets in my kitchen. In addition, Jim restores and sells cast iron cookware that accomplishes many more tasks than the straightforward skillets and Dutch ovens in my cabinet. Cast iron cake or gelatin molds? Yes, he has them. Corn muffin and corn stick pans? Amazing array. Some seem too beautiful to use. But think of the crispy edges this pan can add to each corn stick when a skilled cornbread wizard makes the batter. Cast iron is the Clydesdale of the kitchen, mighty and beautiful at the same time. 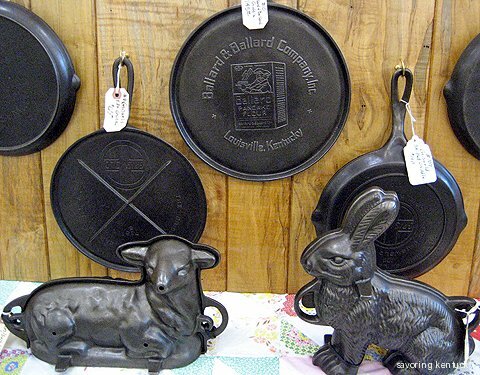 With cookware of the quality Jim collects, restores, and sells, we cooks can use fine cast iron and pass it along as an inheritance across several generations, provided we care for it properly. 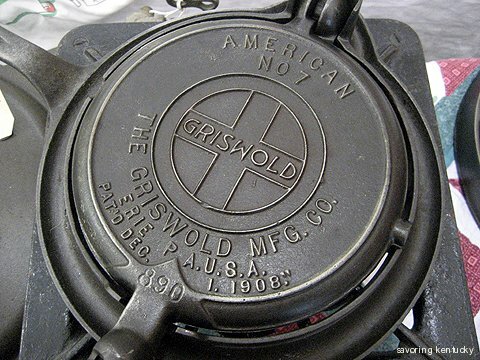 Here are links to several sites related to all aspects of cast iron cookery. Although I did not talk with him much at the time, I first met Jim Nance at a beautiful dinner chef Ouita Michel cooked in cast iron skillets outdoors at Happy Jack's Pumpkin Farm, near Frankfort, Kentucky. I realized then I had never seen cast iron of that quality. I have wanted to meet and write about Jim and his cookware ever since. It has taken only three years to make it happen! In the interim, Lexington Herald-Leader writer Sharon Thompson did an excellent piece about Jim and cast iron, published in several of the McClatchy newspapers around the country. My friends Jim and Jan Nance gather and shell hickory nuts by the gallon when their tree is producing. They make the most delicious chocolate-bourbon-hickory nut pie! We took the recipe and the hickory nuts, lovingly shelled for me by Jim Nance, to the James Beard House for our Beard dinner in 2004. Jim shelled 2 gallons of nuts for those pies-- not to mention harvested them, dried them --- the truest act of culinary friendship I have ever experienced. Jim and Jan are cooking wonders-- and specialize in Kentucky heritage cooking. They make wonderful hickory nut cookies-- and successfully used their wonderful pie to lure me to church. Before I knew them, just after we had moved to the Inn, Chris and I received an entire pie as a welcome to Midway gift. We ate almost every bit of it ourselves!! Not long after, I began to attend services. "God talks to chef through Hickory Nut Pie" -- it could be a book.